Determined to see through the darkest night before the dawn. Our second day of independence awaits. We’re learning. Gotta start to think ahead, and bring two on for every one of us that’s taken away. Hey! Remember ’88? Forever in our nation’s heart, this is the time to restart. ’07 was the spark. We are the ones we’ve been waiting for. We’ll lift ourselves. Inspiration’s there – we’ll take it. On our own two feet we’ll make it. One, two, three, get free! We’ll lift ourselves through political defiance. We’ll put our faith in self-reliance. One, two, three, get free! Together, arm in arm in arm, without the gun. We know where real power can be found. No way to end this until the army and people are one. No more working for the clampdown. Instead we’ve a plan to chip away the foundation. Before long it all falls down. It’s here – a revolution year. If we can persevere and stand disciplined we’ll have a chance. It’s in no one else’s hands: we are the ones we’ve been waiting for. We’ll lift ourselves. Inspiration’s there – we’ll take it. On our own two feet we’ll make it. One, two, three, get free! We’ll lift ourselves through political defiance. We’ll put our faith in self-reliance. One, two, three, get free! None of us are free ’til all of us are free. And to get free it starts right here: freedom from fear. 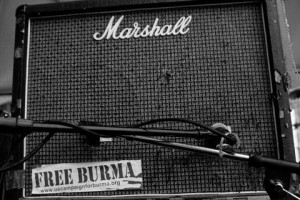 After the release of Aung San Suu Kyi in November 2010, we found this video where she describes the potential benefit of “a really catchy freedom song for Burma”. So we set out to make an attempt, finally finishing a demo in October 2011. We’re currently looking to record this in a studio, so if you like what you hear, and you like the idea of the song, consider helping us raise enough money to reach our goal. All donations are tax-deductible. 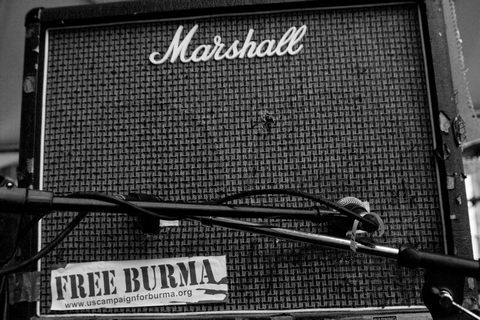 And of course, please forward this to anyone who might enjoy feeling like they were a part of helping this song get made, hopefully inspiring people working for democracy in Burma.